NICOLAS ASFOURI/AFP/Getty ImagesUS President Donald Trump (L) and China’s President Xi Jinping. A note from Goldman Sachs on Friday argues that the most likely outcome of the G20 meeting is that trade tensions escalate further, with Trump moving to impose tariffs on all Chinese goods sent to the US. President Donald Trump heads to Argentina for the G20 summit, and trade talks with Chinese leader Xi Jinping. Goldman Sachs sees over a 50% probability of trade war escalation. The meeting between the two is set to be a crucial moment in the trade conflict between the two nations. To read more about Trump’s trip to Argentina, read Business Insider’s comprehensive preview of the meeting. President Donald Trump and his Chinese counterpart Xi Jinping will meet on the sidelines of the G20 summit in Buenos Aires, Argentina this weekend, in what is among the most widely watched bilateral meetings of 2018. There have been tentative signs that a deal may be struck, but according to analysts at Goldman Sachs, the most likely outcome of the meeting is that the trade war actually escalates. “We currently see ‘escalation’ as the most likely outcome in the next few months, with slightly over a 50% probability,” the note from a Goldman team led by Andrew Tilton said. On the line is the future of global trade, with a positive meeting likely seeing a deescalation of the trade conflict between the two countries, and a negative one threatening to see the start of a full blown trade war. As it stands, tariffs have been levied by the Trump administration on around half of all Chinese goods imported to the USA, with a value of about $US250 billion. China has imposed retaliatory tariffs on around $US110 billion of US goods. An unsuccessful meeting, however, could see that number double, with the US levying tariffs on all $US500 billion or so of Chinese goods that come into the USA each year. 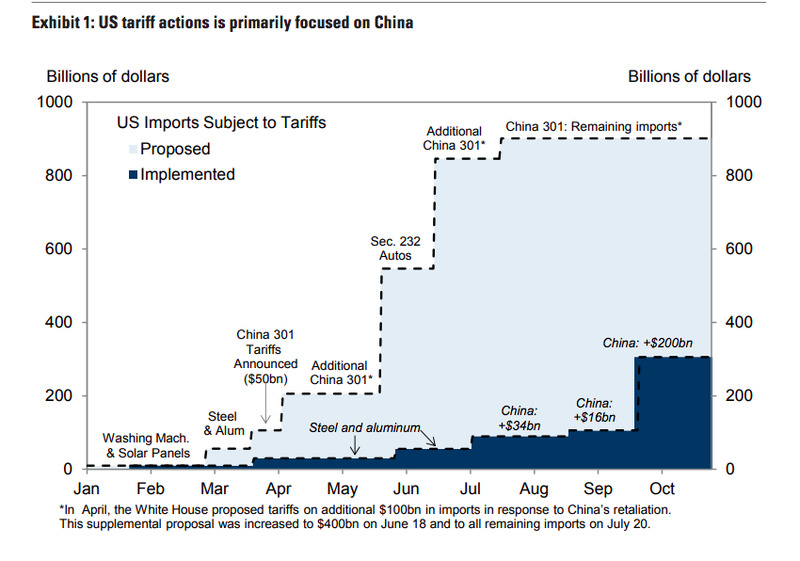 The pause scenario, Goldman says, means: “existing tariffs remain in place but the two sides agree to keep talking with escalation put on hold,” the analysts wrote. The assets most sensitive to the trade outcome are likely to be the renminbi and equities, Goldman Sachs said.